Elle Stauffer of Germantown Academy drives down the court followed by Elizabeth Talluto of Shipley in a PAISAA semifinal game on February, 23rd 2018. You don't have to travel far to find future women's college basketball players. There are plenty in Southeastern Pennsylvania and South Jersey. Germantown Academy has constructed a top-notch roster filled with talent from top to bottom, and Pennsauken, Gloucester Catholic, and Moorstown all boast top-ranked players. Seniors Cat Polisano and Alexa Naessens, junior Rachel Balzer, and sophomores Elle Stauffer, Maddie Vizza, and Jaye Haynes guided Germantown Academy to a 24-4 overall record during the regular season, including a 12-0 mark in the competitive Inter-Ac League. Polisano, who was named Inter-Ac MVP for the season, will continue her basketball career at Fordham. Naessens, the starting center and vocal leader in the paint, will play college basketball at Colgate. Blazer, a 5-foot-10 guard, has orally committed to George Mason. Stauffer averaged 11 points and seven rebounds per game and had six double-double performances this season. The 5-foot-11 guard/forward shot 67 percent from the field and has more than 400 career points. Schools from the Patriot League, Ivy League, Big East, and Colonial Athletic Association have shown interest in Stauffer. "A game-changer with exceptional athleticism," Germantown Academy coach Sherri Retif said. "She frequently leads the fastbreak and can finish around the rim." Stauffer has had plenty of support throughout the recruiting process, including leadership from Retif. "Coach has been really helpful," Stauffer said. "She has great communication with other coaches and knows how to make us bigger prospects." Haynes averaged 12.2 points, five rebounds, and three steals this season. The 5-foot-9 guard shot 49 percent from the field and 40 percent from beyond the arc. Haynes has more than 500 career points. Her father, Jonathan, was a star point guard at Villanova. She has gained interest from schools in the Atlantic Ten, Patriot, America East, and Metro Atlantic Athletic Conference. Retif provided a scouting report on Haynes: "Solid on both ends of the court. Can slash to the goal with her tight crossover or pull up for the three. An athletic defensive specialist who willingly accepts the toughest assignment." Haynes and Stauffer were both named first-team all-Inter-Ac for the first time this season. Despite missing time because of injuries this season, Vizza is gaining interest from schools in the Patriot, Ivy, and Atlantic Ten. "It's a life decision, not a basketball decision," said Vizza. Of Vizza, Retif said: "Savvy point guard with excellent court vision and a tight handle. Can also hit the long-range three with consistency." 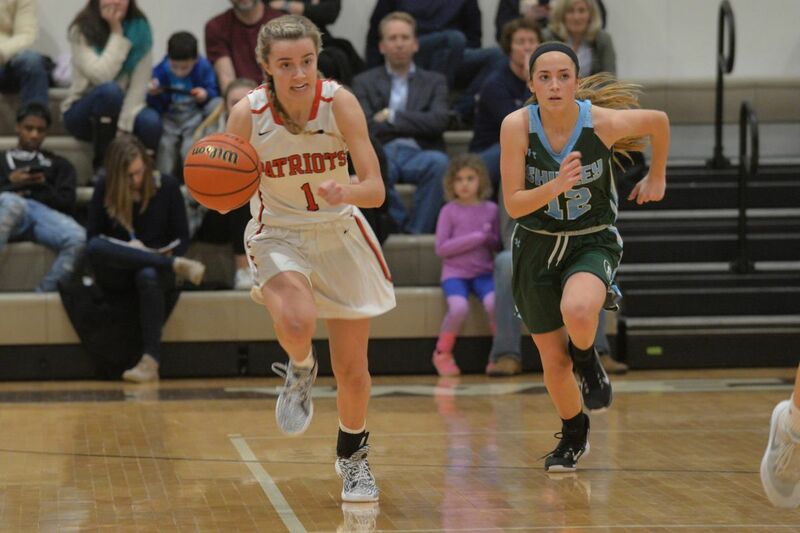 Germantown Academy guard Maddie Vizza has drawn interest from schools in the Patriot League, Ivy League and Atlantic Ten Conference. Stauffer, Haynes, and Vizza all made it clear that they want to attend a school with a strong academic program. In South Jersey, Pennsauken senior Shayla Sweeney has already signed with La Salle. The 5-11 combo guard is one of South Jersey's most athletic and polished players, and she went from averaging 5.7 points per game as a freshman to 17.6 last season, when she netted her 1,000th career point. "It felt great to know that everything I worked for paid off," Sweeney said of committing to La Salle. At Gloucester Catholic, junior shooting guard Azana Baines has narrowed her top 15 schools to Rutgers, Temple, St. Joseph's, Penn State, Vanderbilt, Boston College, Virginia Tech, Michigan, Minnesota State, Miami, Wisconsin, Kentucky, West Virginia, Duke, and Georgia Tech. The 6-1 Baines is a smooth ball handler who often uses her height to get to the basket and has flashed an improved three-point shot. "It's all about staying focused," Baines said. Gloucester Catholic junior Azana Baines has narrowed her college choices to 15 schools. Moorestown senior Faith Bonett, a 6-foot New Hampshire recruit, has been a contributor since her freshman season. Mainland's 6-4 sophomore, Kylee Watson, listed as a five-star recruit by ESPN, spent last summer with the USA Basketball under-16 national team at the 2017 FIBA America under-16 championships in Buenos Aires. She also helped lead her team to a gold medal and a ticket to this year's FIBA under-17 World Cup. "The bottom line is she makes my job so much easier just because she is so fantastic as a basketball player," Mainland coach Scott Betson said. Shipley's Anna Camden is another player to watch. The junior forward surpassed 1,000 career points this season and ranks fourth all-time at Shipley. In addition to making more than 40 three-pointers, Camden averaged 17.6 points, 10.1 rebounds, and 2.4 blocks this season. Camden has offers from Penn State and Virginia Tech and is also receiving heavy interest from Florida. She doesn't have to look far for support during the recruiting process. Her friend Sam Sessoms is a star player on the boys' basketball team. Sessoms reached the 2,000-point milestone this season and will be continuing his basketball career at Binghamton. "We've had countless conversations about the recruiting process and the game in general," Camden said. "Just two athletes talking about a process that not everyone goes through." Shipley coach Sean Costello said of Camden: "Anna is a versatile post player that has developed significant range on her jump shot the past year. She has incredible footwork in the post. She is a tireless worker. She projects out to be a stretch 4 at the college level. At 6-foot-2 she can dominate a game inside and create mismatches on the perimeter." Anna Camden (right) has has offers from Penn State and Virginia Tech. Garnet Valley also has a junior who joined the 1,000-point club this season. Emily McAteer was named MVP at the Hoops for Hope Tournament (University of the Sciences) and earned the same award at the Philly Play-by-Play Classic Tournament (Jefferson University). "It's been great," McAteer said of her high school career. "Just coming in as a freshman, it was my dream to play varsity. I never really thought I would reach 1,000 points as a junior. I owe everything to my coaches, teammates, and family." She averaged 15 points, 6.8 rebounds, 2.2 assists, and 2.3 steals while helping the Jaguars finish the regular season undefeated in Central League play. A loss to Springfield- Delco in the league championship game ended Garnet Valley's run of four consecutive titles. The Jaguars, however, have advanced far enough in the District 1 Class 6A tournament to qualify for states. McAteer, who was named Central League MVP during her sophomore year, is being recruited by Division I and II schools, including the Naval Academy, West Point, Quinnipiac, and University of the Sciences. Her parents have been very helpful. In fact, her basketball coach as a child was her mother, who played basketball and swam in college. Garnet Valley coach Joe Woods said of McAteer: "Emily has excellent three-point range as well as solid interior post-up moves. She is an excellent free-throw shooter and is a fierce defender, rebounder, and competitor." McAteer was just one piece of the Jaguars' success this season. Senior Nicole Barnes (Widener), senior Maddy Sorokanych (Ursinus), and junior Brianne Borcky (Drexel) will all be playing basketball at the next level. In addition, juniors Morgan Falcone and Jillian Nagy are getting interest from Division III schools. Souderton, which is also from District 1 Class 6A, has qualified for states for a second straight year thanks to a core group of players. Seniors Kate Connolly (Drexel), Alana Cardona (IUP), Tori Dowd (Muhlenberg), and Sami Falencki (Arcadia) will be continuing their basketball careers in college. Juniors Megan Walbrandt (Division I and II) and Megan Bealer (Division II and III) have received plenty of interest. Other star players from Class 6A include Plymouth Whitemarsh's Taylor O'Brien (Bucknell) and Central Bucks South's Haley Meinel (Thomas Jefferson University). Plymouth Whitemarsh guard Taylor O’Brien is set to attend Bucknell. George Washington junior Isabella Vazquez and sophomore Ireland Smith took control of a young team this season and guided them to the third round of the Philadelphia Public League playoffs. Vazquez, who is among the top scorers in the city, averaged 22.1 points and eight rebounds this season. Since transferring to Washington from Archbishop Ryan, Vazquez is 29-8 when on the court for the Eagles. Basketball has always been a big part of Vazquez's life. She recalls intensely watching the NCAA tournament as a child. "Everything revolves around basketball," Vazquez said,. "I always knew that this is what I wanted to do." Smith has started every game since her freshman season, when she put up 193 points. She averaged 12.9 points this season for a total of 258. Washington is 30-8 since Smith's arrival. "I am a person that sees the full court and looks for the passes," said Smith, who averaged nine assists this season. The Public League also has standout players such as Audenried's Denijsha Wilson (Labette Community College), who is the all-time leading scorer in school history with more than 1,500 points. Imhotep Charter junior Alana Swift has offers from Longwood, Hartford, and Florida International. Math, Civics, and Sciences junior Quameerah Gray averaged 27 points this season to gain the attention of Division II schools. All of the players pointed out the importance of AAU basketball, which is a crucial avenue for young players trying to play in college. The Philadelphia Belles, Comets, and Lady Runnin' Rebels are three of the well-known programs in the area. New Hope-Solebury point guard Sarah Wilson plays three sports. The college decision-making process can be extra difficult for athletes who excel in multiple sports. For New Hope-Solebury's Sarah Wilson, it simply came down to her love of basketball. Wilson could have easily picked softball or field hockey. She has been a first-team all-state selection in softball since she was a freshman. Also a first-team all-state selection in field hockey, Wilson surpassed the 100-goal milestone this fall. She also set a school record with 56 goals during a sensational season that saw the Lions win the program's first district championship. But Wilson opted to continue her basketball career at Nyack, a Christian college in New York, despite her superior talent level in the other two sports. She received heavy interest from Division I schools, especially for field hockey. "It wasn't until the end of my junior year when I realized how much I loved basketball over the other sports," Wilson said. New Hope-Solebury basketball coach Andy Krasna recalled coming out of the gym after working with the middle-school girls at the high school and hearing the sound of a bouncing basketball. There was Wilson practicing her ballhandling skills in the dark. "All along she said I want to play basketball in college," Krasna said. "We told her you really have to develop your game before that happens." Wilson did just that. The point guard went from averaging just 2.2 points per game as a freshman to 14.2 as a senior. She was named the 2018 Bicentennial Athletic League player of the year. "I think she's going to be a really good college basketball player," Krasna said. "Due to her success and accolades in field hockey and softball, she's received more recognition in those sports." Wilson is the sixth of 13 children. Her father, Chuck, is the senior pastor at New Hope Community Church. Faith and family played big roles in Wilson's decision to attend Nyack. Nahemiah Johnson (left) and Tahmiyaah Jackson of Mastery North celebrate after their 57-55 victory over Imhotep in last year’s Public League title game. In an area filled with numerous well-known high schools, it becomes extremely difficult for players at smaller schools to get recruited. MaST Community Charter School, a Class 3A school in Northeast Philadelphia, is a great example of this. Edwin Vazquez Jr. has done an outstanding job of turning around the girls' basketball program, which he took over four years ago. The Panthers went from the basement to the best season in school history. Vazquez led this season's team to 11 wins overall, including six in the Bicentennial League Independence Division. In his first season, Vazquez had only about 13 girls try out for the team. Now, the program is starting to draw scouts to some of its games. "It really shows the work that we put in during the offseason," Vazquez said. "Everything that we've done has paid off." Senior Allyson Holtz, who also plays soccer, has been the point guard since Vazquez took over when she was a freshman. After not even breaking 80 points in her first season, Holtz scored more than 200 in each of the last two seasons. The feat is impressive considering that MaST put up about 800 points as a team this season. Just 5-foot-3, Holtz also bounced back from a broken ankle that shortened her sophomore year. "To see where she's come from, it really makes me feel good," Vazquez said. "I run a system with a lot of plays and she picks up on them very fast." Holtz has received interest from a few Division III schools, mainly for soccer, but Vazquez has been sure to show those coaches her basketball highlights. She plans to make a decision by the end of next week. "If I could play both sports, I would love to," Holtz said. "I guess right now it comes down to the fact that I've been playing soccer longer." Junior Katelyn Fowler is another player to watch. This season, she averaged 11.1 points per game to go along with 4.9 rebounds and 3.2 steals. Fowler finished second in scoring in the Bicentennial League behind Jenkintown's Jennifer Kremp. Both Holtz and Fowler were named first-team BAL Independence Division this season. Freshman Alexa Murphy and incoming freshman Molly Farrell are also key components to a small school looking to get on the recruiting map.